MS means more than Middle School. “Eleven year old Maggie Mayfield can’t stop thinking about Oreos and this is just one of her many conundrums. She also has two older sisters with bods that don’t stop and she has to wait to campaign for President for almost an entire quarter century. Then in one summer, her conundrums triple when her father takes a fall at work. What happened? The truth? It’s not what happened to him, it’s what’s happening to him. 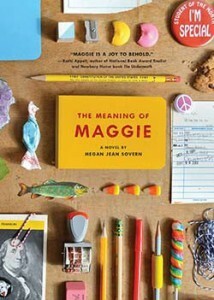 The Meaning of Maggie is a novel set in a house too small for all the big problems plaguing a smart girl just trying to survive adolescence armed with after school snacks and deep thoughts. When her father’s legs permanently fall asleep, Maggie begins a search for meaning that she never expected. And just like that, getting a B doesn’t seem like such a HUGE DEAL*. *Okay getting a B is still a huge deal. But you get the idea.